The new Xbox 360 4GB console with Kinect has built-in wi-fi, a black wireless controller, a standard definition composite A/V cable, a Kinect Sensor, the Kinect Adventures game, and even comes with a free one-month Xbox LIVE Gold Membership. and a black play and charge kit. The Xbox 360 Console with Kinect. Kinect brings games and entertainment to life in extraordinary new ways—no controller required. Easy to use and instantly fun, Kinect gets everyone off the couch moving, laughing, and cheering. See a ball? Kick it. Control a HD movie with the wave of the hand. Want to join a friend in the fun? Simply jump in. Wi-Fi is built-in for easier connection to the world of entertainment on Xbox LIVE, where HD movies and TV stream in an instant. Xbox 360 is more games, entertainment, and fun. Kinect sensor: With the Kinect sensor, you can experience gaming like never before. Easy to use and fun for everyone, the Kinect sensor utilizes revolutionary full-body tracking to put you in the center of the fun. This amazing new technology allows the sensor to recognize your body and mirror your movements in the game, making you the controller. The sensor is compatible with every Xbox 360 and comes with a Kinect game. With Kinect, Xbox 360 now has the best controller ever made—YOU. Built-in Wi-Fi: The new Xbox 360 is the only console with 802.11n Wi-Fi built-in for a faster and easier connection to Xbox LIVE. Stream HD movies and TV or download games from Xbox LIVE in 1080p and 5.1 surround sound from anywhere in the house. * Compatible with b/g/n networks. Xbox 360 wireless controller (black): This award-winning high performance wireless controller features a range of up to 30 feet and a battery life of 30 hours on two AA batteries. More ports: Connect more accessories and storage solutions with added USB ports. Now with a total of five (three back/two front), you’ll find more places to plug and play. Plus, in addition to the standard Ethernet port and HDMI output, we’ve added an integrated optical audio out port for an easier connection to the booming sound of your A/V receiver. Kinect Adventures game: Float in outer space. Experience the thrill of roaring rapids. Tackle mountaintop obstacle courses. And dive into the deep to explore a leaky underwater observatory—all from your living room. With Kinect Adventures, you are the controller as you jump, dodge, and kick your way through exciting adventures set in a variety of exotic locations. *Kinect sensor and supported games coming November 2010. Console memory is internal flash memory -- this is not a hard drive. Some games and Xbox LIVE features may require an additional hard drive (sold separately). Xbox 360 S console hard drives are the only hard drives that will work with this console. Xbox 360 Memory Unit accessories will not work with this console. Xbox LIVE Gold Membership and/or other subscription and requirements may apply for Xbox LIVE features. See www.xbox.com.live. Easy to use and instantly fun, Kinect gets everyone off the couch and moving, laughing and cheering. See a ball? Kick it. Want to join a friend in the fun? Simply jump in. Once you wave your hand to activate the sensor, your Kinect will be able to recognise you and access your Avatar. Then you’ll be able to jump in and out of different games, and show off and share your moves. 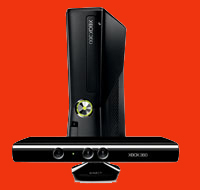 Kinect uses advanced entertainment technology to respond to the sound of your voice. Just say “Xbox” to reveal a series of voice commands. So you’ll be able to control HD movies with the sound of your voice—no remote required. Enjoy HD movies through Xbox LIVE without any extra accessories. Whether you’re a gamer or not, anyone can play and have a blast. And with advanced parental controls and movies for the family, Kinect promises a gaming experience that’s safe, secure and fun for everyone. Easy to use and instantly fun, Kinect gets your whole body in the game. Imagine controlling movies and music with the wave of a hand or the sound of your voice. With Kinect, technology evaporates, letting the natural magic in all of us shine. And the best part is Kinect works with every Xbox 360. Kinect uses a motion sensor that tracks your entire body. So when you play, it’s not only about your hands and thumbs. It’s about all of you. Arms, legs, knees, waist, hips and so on. Which means to get into the game, you’ll need to jump off the couch. As you play, Kinect creates a digital skeleton of your avatar based on depth data. So when you move left or right or jump around, our sensor will process it and translate it into gameplay. Kinect ID remembers who you are by collecting physical data that’s stored in their profile. So when you want to play again, your Kinect will know it’s you. Kinect uses four strategically placed microphones within the sensor to determine a profile of the room you play in, which makes it calibrated perfectly to pick up your voice. It’s simple, but there’s a few easy rules to follow. You should set the sensor between two to six feet off the ground and centered with your TV. Place it on a safe and secure surface, as close to the edge without hanging over. And make sure there’s no direct sunlight on the sensor or on you. See? That’s easy enough. Kinect needs to see you in your entirety. That means head to toes. So if you’re playing alone, we recommend standing six feet away from the sensor. For two players, you both should be at least eight feet away*. This will allow the Kinect sensor to see you the best and provide the most accurate gameplay. Moving your hand controls the pointer on screen. Hold the palm of your hand over whatever it is you want to do. Once it lights up, you’re good to go. Introductions are easy. Just look at your Kinect sensor and wave. It’ll find you, read you and then your avatar will appear. If you haven’t played yet, it’ll then create an avatar for you to adapt. Hold your left hand out and down to activate the Kinect Guide. Make sure to keep your right arm down. From there, you can pause the game, check out your profile, friends, tune the sensor or, if you’re hooked up with Xbox LIVE, access the Kinect Hub. A microphone icon will indicate that the speech recognition has been enabled. Just say “Xbox” to reveal all the voice commands available for you to speak. Xbox LIVE is the online gaming and entertainment service for your Xbox 360. With Xbox LIVE you can download and watch movies in HD, play thousands of downloadable games and access sites like Facebook and Twitter. What can Kinect do with Xbox LIVE? Kinect is fun on its own. But activating it with an Xbox LIVE Gold membership powers it with it endless entertainment possibilities. You’ll be able to control HD movies on Zune and Video Kinect will allow you to video chat with your friends right from your TV. 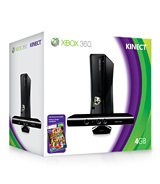 Kinect™ for Xbox 360® has a collection of games to suit any style of play. And they’re designed for full body play, so each one is as unique as the person playing them. Yep, that means you.